My father gave me a crystal radio set when I was around eight or nine years old. It was truly amazing! Just a few electronic components, an earphone, and two short wires with alligator clips. Without a battery or any other source of power, this magical little device would pick up radio stations and play them through the earphone. All I had to do was attach one of the alligator clips to an "antenna." I soon discovered that most metallic objects a few feet in length made good enough antennas to bring in the closest AM station. Attaching the second alligator clip to metal that was “grounded” or in contact with the earth improved signal strength and brought in weaker signals. Those childhood “experiments” soon taught me that some metal objects were much better antennas than others, and that bigger metal was not always better. I have never forgotten the anticipation and excitement of attaching alligator clips to new materials and then hearing the results through the earphone. I was hooked. The fascination of signaling through space without wires would become my primary hobby for the next half century. While writing this article, I realized I have actually been experimenting with antennas since I was in elementary school. Later in life, I studied electronics and then electrical engineering. I learned about resonance and how radio frequencies have electrical wavelengths. Around 1969, I got my first ham radio license. Over the last 45 years, I have built dipoles, ground planes, J-poles, quads, yagis, quagis, delta loops, and long wires. In addition to the traditional copper wire, I have cobbled them together using EMT and rigid aluminum conduit; copper, aluminum, and stainless steel tubing; brass welding rods; and even barbed wire. I have also used antenna tuners to load up bedsprings, fences, house wiring, abandoned telephone line, umbrellas, farm wagons, aluminum gutters, and tin roofs. A couple of months ago, my wife had an accident that injured her right foot. X-rays confirmed bones were broken, and an orthopedic surgeon sent her home with a cast and a set of shiny, new, adjustable aluminum crutches. When all the medical excitement was over, I had time to take a closer look at her hobbling around on those crutches. That’s when I spotted the six-meter antenna hidden in them. A few minutes with the tape measure not only confirmed the 6M antenna, but also discovered a 4M dipole. All I needed to do was get the wife healed up and the crutches would be mine. Eventually, the broken bones did mend and the crutches became surplus to her. That made them prime material for a novel antenna that would also become an eye-catching conversation piece. My particular set of crutches happen to be rated for 300 pounds. Each crutch has two separate adjustments. The upper section has three settings 5-1/2 inches and 6 inches apart. The lower section has 13 positions in one inch increments. Refer to Figure 1. When everything on one crutch is extended to its maximum length, it measures approximately 60 inches. 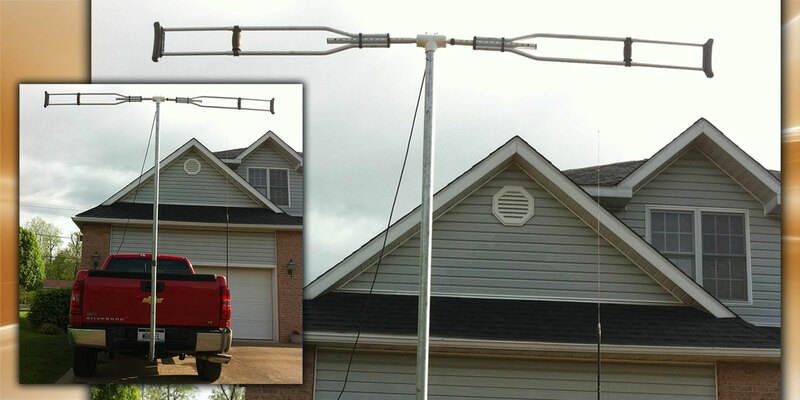 Certainly long enough to make a 112 inch 6M dipole! Compressing all the adjustments reduces the same crutch to 36-1/2 inches. Plugging these dimensions into the old standby dipole formula (468/MHz = inches) indicates half-wave resonances from about 47 MHz to 78 MHz. Great! Now, all I needed to do was find a way to put the two crutches together and feed them with coax. My crutches are sold by Walgreens (Item 276734) for around $46. However, I have found that crutches must be surplus for a lot of other people. Since starting this project, I have seen several sets at flea markets for around $2. That’s definitely the place to buy this antenna hardware. 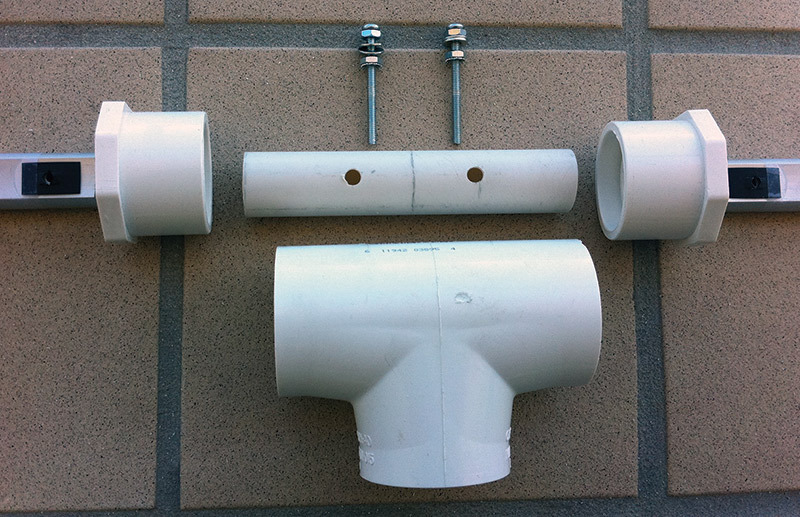 I found the bottom (foot) of each crutch was almost the perfect size for a slip-fit inside 3/4 inch ASTM D 2241 PVC pipe. The feet had already been drilled with 1/8 inch holes. Reaming the holes just a little allowed #8-32 screws to pass through. The holes turned out to be perfect for securing the crutches to the pipe, but the 3/4 inch thin wall PVC looked a little light for supporting the weight of extended crutches. A 1-1/2 inch schedule 40 PVC tee and two 3/4-1-1/2 reducing bushings appeared to be just the right size for reinforcing the lighter 3/4 inch PVC. Check out Figure 2 and Figure 3. Home Depot had all the PVC parts and the hardware in stock for less than $11. Total cost of my project would have been around $12 if I had bought my crutches at the flea market. Initially, I bought #8-32 x 3 inch machine screws long enough to pass all the way through the tee, fasten the crutches, and terminate the RG-58 coax. As I was drilling the PVC, I noticed #8-32 nuts would fit in the space between the crutch foot and the 3/4 inch PVC, so I decided to drill holes in only one side of the tee and the short 3/4 inch sleeve. I believe this design provides better electrical connections and also increases structural rigidity. I built the antenna (Figure 4) in just over two hours after I had collected all the materials. The only tools I used were a hacksaw, screwdriver, drill bit, and pair of long nose pliers. When the completed antenna was up in the air on top of a short joint of 1-1/2 inch schedule 40 rigid conduit, the dipole needed to be shortened to 98 inches for an SWR of 1.1 from 50 to 51 MHz (Figure 5). Robert Fischer WB8BEL is a physicist and electrical engineer. He specializes in process instrumentation and maintenance reliability. He can be reached at [email protected].